Smoke from dozens of nearby forest fires have blanketed the Chilean capital of Santiago, leading authorities to issue a health alert. The fast-spreading fires reached a peak over the past week and have caused more than $100m in property losses while creating the worst air quality in the capital for 15 years. 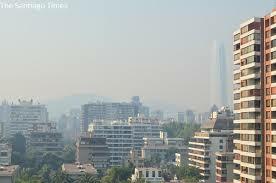 Strong winds carried a thick blanket of smoke over Santiago, where 40% of Chileans live. Firefighters have been struggling with the blazes as the wind has reignited several of them. President Sebastian Piñera announced the health alert for four regions at a press conference on Wednesday [8 Jan]. Piñera said the more than 70 forest fires over the past weeks had affected more than 40,000 hectares (100,000 acres) of land. The emergency measure will be administered by Chile's health minister. It grants special powers to protect the health of those affected by the blazes, including ordering extra masks and oxygen tanks or the hiring of more ambulances and medical staff. Piñera also said the alert was issued to curb the spread of diseases transmitted by rodents, which have been fleeing the fires. Earlier in the week, the Santiago government warned residents about the poor air quality and asked them to avoid exercising outdoors.